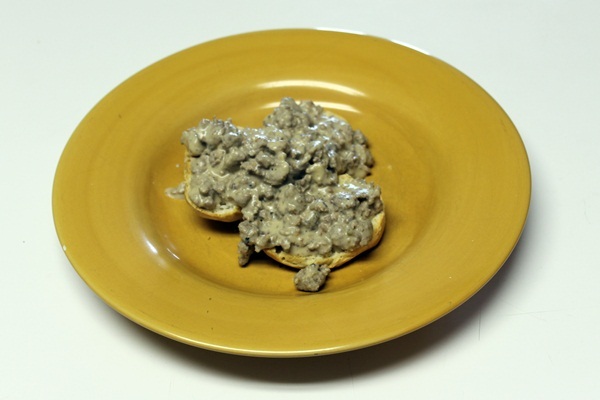 That said, I made biscuits and gravy this morning and it was A-mazing! I know biscuits and gravy are not 100% primal, but we aren’t going for 100% all the time anyway. I tried to keep our carbs down by using Pillsbury’s new Simply Buttermilk Biscuits – 15 carbs per biscuit – and we each only had one and 1/2 biscuit. The gravy I adapted from a recipe I found here. Similar to my fellow blogger, I browned my sausage (about a pound of homemade sausage) and then added the coconut flour which immediately dried up the pan. I then added the cream cheese but it wasn’t melting well and my pan was crusting over at the bottom because it was so dry. So I added a bit of water to de-glaze the pan. The water eventually cooked down and I added the almond milk. I simmered it for about 10-15 minutes with a lid. Then I took the lid off and let it continue to simmer while the biscuits baked for 14 minutes. The cream cheese took a long time to really break down and be fully incorporated but in the end it all came together really well. It was awesome. 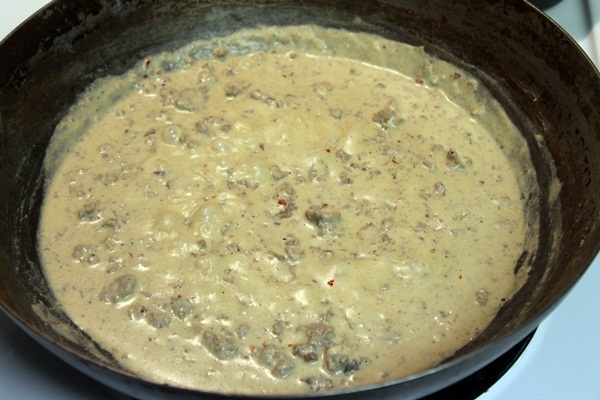 I really couldn’t taste a difference in this gravy from any traditional gravy, it was just as good if not better. I wish I could show you how we made the sausage because it’s got all sorts of herbs and spices as well as jalapeno in it and it is really what packs some amazing flavor into the dish. But the last time we made a batch I must have been doing other things because I didn’t document our process. I’ll get it next time around. Savory seasonings stimulate the appetite. I know it’s not Monday but I forgot to include my review of Buried so I’m diverging from form and talking about movies today. We watched this little jewel last week. If I had known how “Blair Witch Project-esque” Buried was, I would not have put it on our netflix queue. This movie was an entire 90 minutes of one man trapped inside a box. I’m not kidding you. Admittedly, it kept our interest and it was somewhat thrilling, getting our hopes up that he might escape. But sadly, it is not a movie I would recommend to anyone. Don however went to work the next day and told folks, “I saw this awesome movie last night! You’ve got to see it, it’s called Buried.” I’m waiting for one of the guys to come back to Don and say, “You thought that was great?” Don will laugh and say, “No, but tricking you into watching it was.” lol He’s such a troublemaker. This week we watched The Lincoln Lawyer. I don’t like the title but I liked this movie. The story makes me thankful that I’m not a lawyer. Matthew McConaughey plays a sleazy defense attorney who seems to have no morals but as the story progresses the depth of his character is revealed. I saw in the opening credits that it was based on a book and I couldn’t help but think that it would probably be a really good read. The inner turmoil of a character is hard to convey on the screen. Not wanting to give anything away I would just say that if you like court room drama, or just to look at Matthew McConaughey, then this movie will be worth your while. There are also A LOT of other familiar faces in this movie and it makes for an interesting ensemble. Last night we watched Sucker Punch. Weird movie. It is a dark story of a young girl institutionalized by her abusive stepfather. She is scheduled for a lobotomy and in the few days before the procedure, she creates an alternative reality in an attempt to escape, both mentally and physically. It is a story of empowerment and it is sad and hopeful at the same time. The action dream sequences are over the top and were less appealing to me than I thought they would be but I still enjoyed the movie overall. I’ve seen the story criticized as formulaic and I don’t disagree. Despite that, the ending surprised me so even though the plot might seem too driven by formula, it wasn’t predictable. I’ll admit it was losing me somewhere in the middle because I wasn’t sure how it was all going to tie together (or maybe it was the repeated interruptions we had last night that made us have to pause and start again a number of times) but I hung in there hoping it would come together sensibly and it did. If you like fantasy and/or action, you just might like this movie. I shall call him squishy and he shall be mine. He shall be my squishy. Come here squishy! Today is the last day to enter to win tickets to attend the Creative Connection Event! This HUGE event will be held in St. Paul, MN in September 15-17, 2011. It is a 3-day conference packed with creative sessions and workshops designed to help women to capture their creative interests and turn them in to a business, or to grow their existing business. You can check out the schedule of events here. In addition to all the general sessions on marketing and business development, there are hands on sessions on knitting, photography (oh yeah! ), cooking, baking, screenprinting, painting, writing children’s books, making jewelry, and so many more crafts I can’t even list them all. Take a few minutes to explore the ways to enter to win two tickets, plus hotel, for this event. What can you lose? I finished Barefoot by Elin Hilderbrand last night. I was unimpressed. In fact I was skimming over it for the latter half of the book because at times the descriptions rambled and I just wasn’t interested. I didn’t connect with the characters either. I had read a lot of good reviews so I hung in there, waiting for that moment that it would all come together and wow me, but that never happened. It was ok for light reading and I can see how it might appeal to some, but it just wasn’t for me. I am so excited to start my next book, A Dance With Dragons, the latest installment of the Song of Ice and Fire series by George R. R. Martin. (The story behind the recent HBO series Game of Thrones.) Thanks to Colynn for loaning me her brand new copy of the book that she hasn’t even read yet! I’m a little uncertain about diving in without refreshing over the previous books. I’m afraid I’ll have forgotten details that would have enriched my reading if I were to go back and re-read the previous books. But, I don’t have the patience to go back through them, nor do I own copies so I’m going to give it a go on this one and hope that Martin included enough past details to help me recall things as I go along. While we are talking books, I’ll include day 4 on the book reflection challenge. Spam. The meat, not the junk mail. Spam has such a bad rap. You might not know that Spam is made from chopped pork shoulder meat, ham meat, salt, water, sugar, and sodium nitrate. It’s really not a “mystery food” or all the leftover parts of the pig. Believe it or not, there are entire cookbooks out there, dedicated to recipes using Spam. It’s great for soup, sandwiches, salads, casseroles, omelets, you name it. I think of it this way, if ham could be used, then Spam could be used just as well. I won’t say it’s the best thing I’ve ever tasted. I don’t crave the taste (I think Don does.) But it’s good. 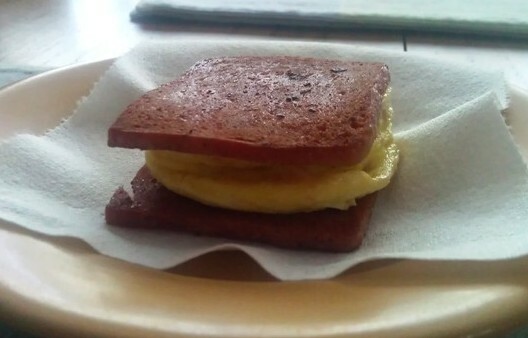 We used to make breakfast sandwiches with muffins, a slice of Spam, and an egg. Making these little beauties is simple. 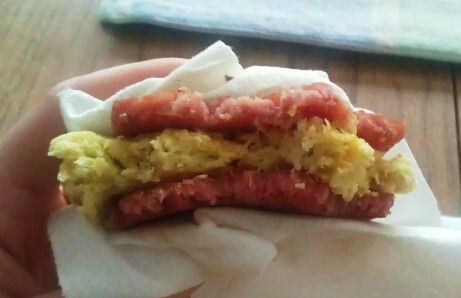 Cut four slices of Spam (if you’re making two sandwiches.) Use a skillet to fry them till they are brown. Keep an eye on them and be careful of the heat. I’ve overcooked it before, which dries it out a bit. Don had Hawaii on the brain (some say Spam is Hawaii’s “soul food”) and added these new flavors to our eggs this weekend. I’m proud to say, this experiment was a success! I could really taste the coconut and the nuts, but they were not overpowering. It was just the right bit flavor to give it something different. I encourage you to try Spam! In lieu of a cookbook, here are a couple of websites with recipes to get you started.